Diana al-Atwani, a Syrian translator and volunteer at our Open Art Shelter, writes a thought-provoking piece on her relationship with her mother, and the lessons she has carried forward when fostering bonds with her own son. When I think about the food in Syria, the first thing that comes to my mind is my mother and my holidays at my parents’ house in Syria. We Syrians have a special relationship with food. Our food nostalgia evokes the warmth of home in our very being. 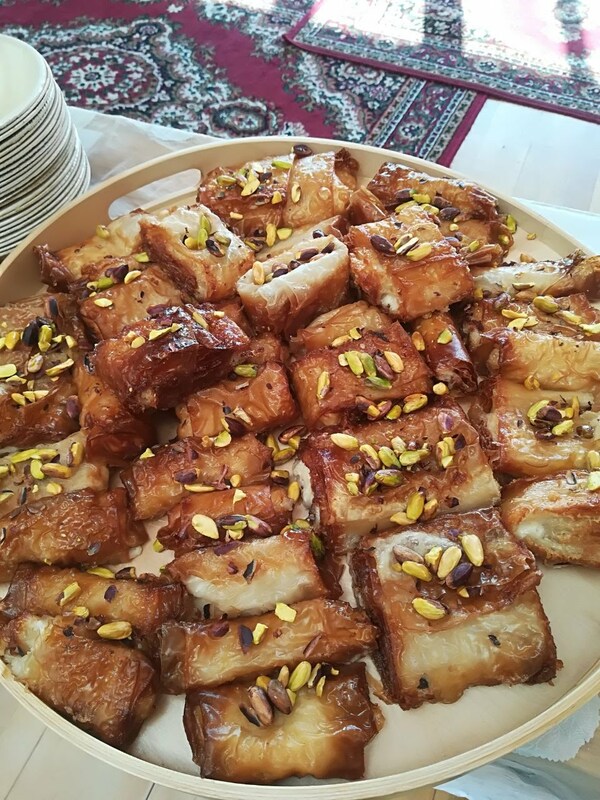 Sometimes, when I’m invited to coffee gatherings I know it won’t be just coffee – it would be preceded by Tabbouleh, Kibbeh, pastries and sometimes a whole feast of various dishes. A Syrian plate is never half-full because the hostess simply keeps refilling it with more food. “You should eat as much you like us,” she’d repeat, a sentence you would absolutely always hear when visiting a Syrian home. There is a certain routine that keeps happening whenever I am at my parents’ place. The first question my mother asks: “What do you feel like eating while you’re here?”. At first, I’d answer with a “nothing specific” right away, but then I’d remember that this answer would give my mum the liberty to be over-creative, cooking loads of dishes super high in calories, leaving the fridge congested during my whole stay. I learned my lesson after 10 or 20 years. Now I tell my mum what I would like to eat. I’d think it would be simpler for both of us and the whole family – even for the poor fridge – that I would spend more time with my mom in the living room instead of the kitchen. I also dreamt about leaving Syria with the same weight and shape I arrived in. 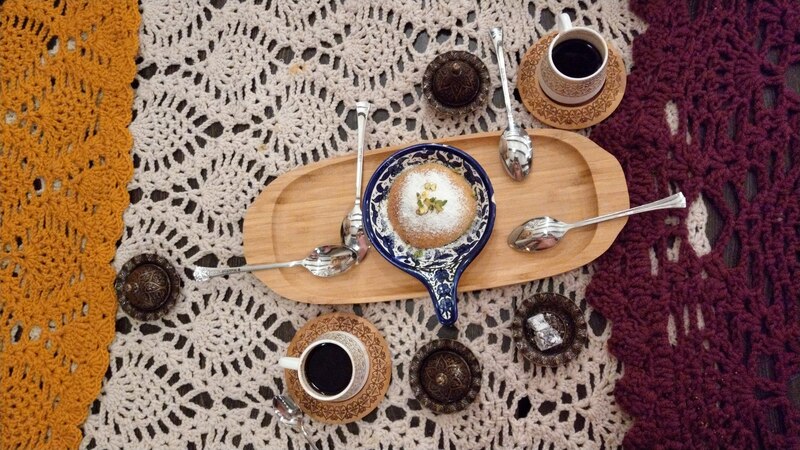 Here is my typical daily routine with my mum: shortly after I’d finish my coffee, my mother would call me to the kitchen and I’d surrender myself to a table littered with colourful small plates – cheeses, Lebneh*, two or three kinds of eggs, Fetteh*, Foul*, the list goes on. As soon we were done eating, I accepted her offer (“Let’s have a coffee!”) hoping to awaken my heavy head. The moment I’d feel that I was a bit more energised, a fruit plate would land on the table. My mother tricks me and my sisters with food now just as she used to do when we were babies. I remember her feeding my little sister while entertaining her with a story, and the moment my sister would open her mouth to ask about something, a heaped spoonful would suddenly sneak inside it. Not long after, lunch would be served – and not with only one main dish and a salad as we agreed, no! Again the poor little table would suffer from the weight of many dishes. I’d protest. My mum’s ready-to-go answer would be: “Oh, just two salads, and your dad doesn’t like Muhshi*, so I did something else”. My Dad smiles and gives me a wink – he knows my mum is using him as an excuse to cook as many dishes for me as she can while I’m there. We never stop chewing. We retreat to the living room with a much needed post-lunch tea. My head feels like a water balloon now, so I fall asleep on the couch. I wake up to the smell of boiling coffee but there is also another fruit plate. Before, my mum would remind us over and over again: “It’s dinner time! Eat something!”. Luckily, she doesn’t prepare dinner this time, so’s a free choice. “I am not hungry” is not an acceptable answer, so I would go to the kitchen and eat something light – if I didn’t, she would prepare sandwiches and bring them while we were watching TV. She’d bring plates of different roasted nuts anyway. I don’t know why I even pack some clothes in my suitcase before I go to Syria. I knew I wouldn’t wear any of them – I am almost defenseless against my mother’s temptations. My mum’s food broke my previous vows. My justification would be: when I eat, I make her happy – which is true, and secretly I also missed the food there. 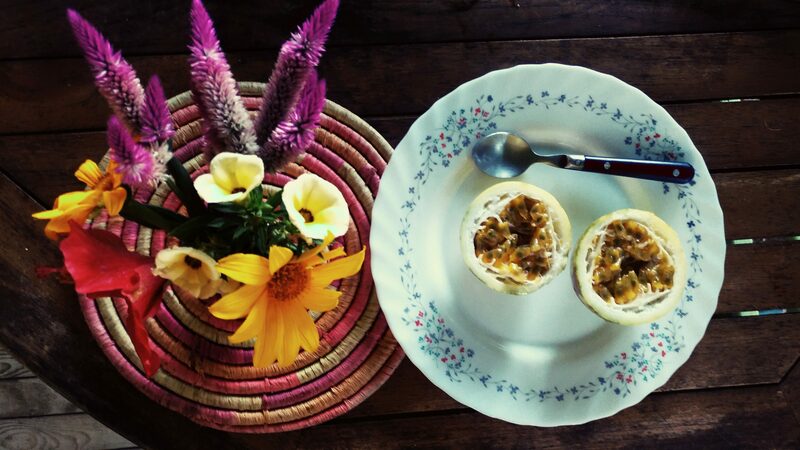 It’s fresh, organic, natural, healthy and most importantly, filled with my mum’s love. On the second day of my holiday, after breakfast, I’d leave the button of my trousers open. I’d open the zip after lunch. Then I would give in and ask my sister for something loose to wear, “Do you want an Abaya?”. Thereafter I’d spend my holiday at home wearing an Abaya*, in the small kitchen, around a small table, with my sisters and their children. 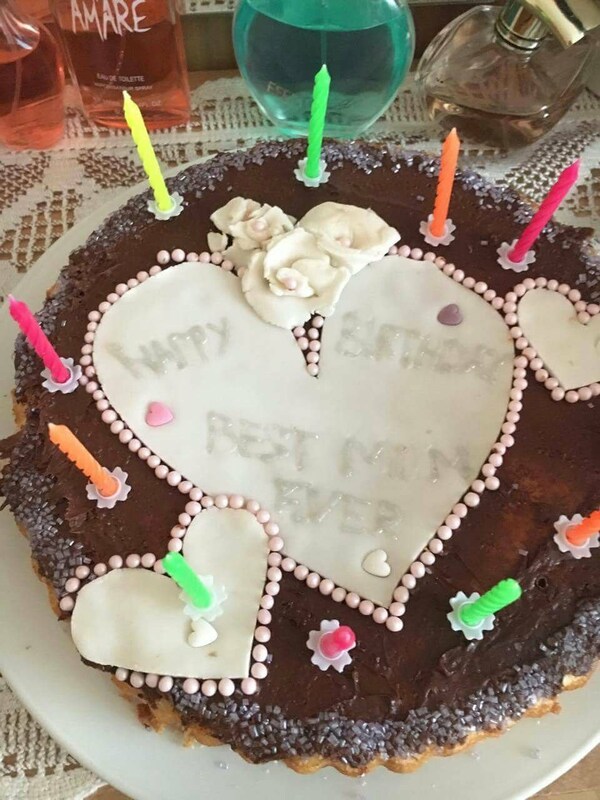 The screams, the laughs, the cries, the non-stop talking, the different aromas of food while being cooked, all that would drive my dad away, but my mother was over the moon – or as we said in Arabic: “on the heart of my mum sweeter than honey”. In the past I used to insist that my mum limit her cooking to one dish and one salad so we don’t spend the entirety of my holiday trapped in the kitchen with her working like a bee the whole day. My mum is a perfectionist – she doesn’t believe anyone can do the job as well as she can. On my insistence that she cook one dish and relax the rest of the day, my mum would accept with resentment. I’d feel her restlessness torturing her. Like most mums in the Middle East, food is a way of expressing her love – unaware of this, I was denying her from loving me the way she knew how to. My relationship with my only son is different. This could be because he’s my only child, or because I’ve lived outside Syria for most of my life. I was influenced by my non-Arabic friends and their relationships with their kids. The way I express my love to my son has been always through ways other than food. I’d play with him when he was a baby, as if I was the same age as him. I’d share his hobbies when he was a teenager: watching a movie, listening to some crazy music, or even riding a terrifying roller-coaster. This way, from time to time, I’d drop the barrier of motherhood – the lectures, the ‘don’t do this’ or ‘don’t do that’, and the scolding. I’d stop being a mum and would be a friend instead. He’d open up to me. Maybe, my way is similar to the way my mum manipulated us so we would open our mouths to eat. I’d manipulate my son to open his mind to me – I didn’t think of it that way at the time, and still enjoy my time with him. We ended up being good friends. He’s almost thirty now, and we still enjoy hanging out together either as friends, or as mother and son. He’d ask me sometimes to prepare some Syrian food that he missed, but we usually used our time together to go out and have some fun: to a restaurant, a café, a concert, or whatever there was out there to do. Back when I lived in Syria, my son was in a university in Europe. Whenever he would go to Syria to spend a few weeks of holiday there, my mother-in-law would accuse me that I wasn’t enough of a loving mother. According to her, before my son arrived, I should have prepared the food he loves and put it in the freezer so that I would have the time to cook other things while he’s still here. If it wasn’t enough spending half of the day in the kitchen while he’s with me, I should now also spend a week or two preparing food and freezing it before he arrives? I’d respond: I love my son in a different way! I don’t claim that I love my son more than my mum loves me (or the other way around). No! But I express my love differently. I’ve questioned the norms and culture in Syria from a young age. I was and still am a feminist. In Europe, the culture doesn’t limit the freedom of a woman, doesn’t frame her exclusively within the word “wife” after she gets married then the word “mother” after she gives birth. In Syria, even if the woman works, or even if she is the sole breadwinner in the house, she still performs her duties as a wife and a mother almost exactly as her mother and grandmother did before her. Life in Europe as it’s here in Germany is very different from the life we once had in Syria. Our kids grew up with two languages: they speak Arabic at home and German almost everywhere else. In my opinion, if a mother limits her relationship with her kids to way it is done in Syria (i.e. taking care of their daily needs) soon the gap, which normally exists between parents and their children as they grow up, would grow even bigger. They may even become strangers inside the same house where they speak the same language; the children would be watching a German movie, for example, but their mother won’t be able to share this precious family time with them. Maybe it’s time to create a new relationship with our kids, to approach them from a different angle. We need to adapt a relationship that differs from the one we had with our parents, one that suits the new place and its culture and shrinks the gap between us and our kids – so one day they won’t think we come from another planet, another era, another reality. I’m speaking to the mothers because of my experience as one, but what I’m saying concerns the father too. We both should put an equal amount of effort to drop parental barriers between us and our kids from time to time. This can be done by creating an open space with our kids and sharing some of their interests and activities; aiming (at least once a week) to be their true friends during this special time. Don’t they say in Arabic: “Be your child’s brother or sister as they grow up”? I’d say: being their friends is even better. When I say drop parental barriers from time to time, it’s because I can’t drop them all the time. It’s our responsibility to take care of our children, but whenever we get the chance to be their friends, we should be sincere about it: no lecturing, advising or guiding. We should just cherish that moment, live it to the fullest and enjoy it – in this way we get closer to our kids and build a strong bond for all time. Yes! “I miss my mother’s coffee and my mother’s freshly baked bread”*, as the lyrics say. I also miss my mother’s food and my relationship with both my parents. It’s a sacred relationship, and I hope that part of this sacred side exists in the relationship between me and my son. I do accept and acknowledge that his generation is different from mine, that we live in Europe not in Syria and that society, culture, and concepts are totally different here. It’s important as parents that we embrace all these differences, that we open ourselves to changes. It would be great if these changes include us so we play a part in our children’s life, a part that goes beyond merely feeding them – and that one day they’d hang out with us voluntarily, not out of duty, guilt or pity. I think I’ve managed to upgrade myself – like an app, to adapt to changes. The updating continues as long these non-stop changes remain. It’s the only way to be actively involved during this time, and in my son’s life, with respect to his privacy and independence. Whenever we meet (as he lives in a neighbouring country) we meet as close friends – we both make sure to enjoy every moment we spend together. There is always something to talk about, to do together, to laugh at. Sometimes I cook and other times he does. There are no obligations or duties from both sides; there is only quality shared time. At the end of the day, food unites us at home or in a restaurant – but friendship unites us beyond locations, ages and time. It creates a bond with our children at any age, wherever they are. That’s why parents should make sure that friendship occupies a greater part of their relationship with their children from a young age, especially during their teens. You won’t imagine how close this bond brings you to your children – so love your children by truly being their friend. *Fetteh: cooked whole chickpeas mixed with yogurt and Tahini sauce and served over deep fried flat bread. Diana al-Atwani is a translator and editor. Diana has been translating books for more than 12 years, from French and English into Arabic and will take part in the Open Art Shelter as a yoga teacher. Over the past 30 years, Diana has moved between several countries (including Nigeria, Switzerland and Turkey) before finally living in Berlin. Her exposure to geographic diversity enriched her linguistic skills and cultural background, giving her a different perspective on life in Syria and abroad. Her encounters with several cultures have helped her gain insights into Syrian society and communities with an analytical mind, and a heart full of love. أول ما يخطر ببالي عندما أفكر بالطعام في سوريا هو أمي وإجازاتي في سوريا، فعلاقتنا بالطعام كعلاقتنا بدفء البيت والأم والمحبة، وأتذكر أيضا جمعات القهوة المسبوقة بالتبولة والكباكيب والفطائر، والولائم, وصاحب أو صاحبة الدعوة يملئ صحني بطعام يكفي لشخصين مردّدا: الأكل على قدر المحبة! هناك روتين كان ولا يزال يتكرر في كل مرة أذهب إلى سوريا وأمضي عدة أيام عند أهلي. أول سؤال تسأله أمي: شو جاي عبالك تاكلي؟ في البداية أقول: ولا شي، ولكن أتذكر أنه من الأفضل أن أُحدّد ما أريد وإلا تفاجئني أمي بأكلات ثقيلة ومليئة بالحريرات. وأعتقد في كل مرة بأنني سأنجح بالمحافظة على وزني وأنني سأمضي وقتا مع أمي في الصالون أكثر من في المطبخ، ولكن بين طاولة الفطور المليئة بكل الأصناف، وبعد الفطور قهوة، وبعدها شويّة فواكه قبل الغدا، ثم الغداء: ولكن يا ماما لماذا كلّ هذه الأصناف؟ ألم نتّفق على المحشي فقط؟ وتجيب أمي: إي بس نوعين سلطة، وأبوكي جاي عباله شي ثاني غير المحشي! وأبي يسمع ويبتسم ويغمزني، هذه حجّة أمي لكي تطبخ لي في أسبوع أكثر ما يُمكنها من الأصناف. وتتابع سلسلة الأكل بعد الغداء، بين قهوة، وشاي، وشي حلو، وفواكه، و بزورات، ثم: قوموا تعشّوا. تتلاعب أمي بي وأخواتي كي نأكل كما كانت تفعل عندما كنا أطفالا. أذكرها عندما كانت تطعم أختي الصغيرة وهي تحكي لها قصة. وما أن تفتح أختي فمها كي تسأل عن شيء ما، حتى تتسلّل ملعقة مليئة بالطعام إلى داخله. كانت تبتسم أمي عندما تنجح في ذلك، والآن تبتسم أيضا عندما نأكل ما تضع أمامنا من دون انتباه. لا أعرف لماذا أذهب مع حقيبة مليئة بالملابس. فأنا ضعيفة أمام إغراءات أمي. حجتي هي دائما: أنني عندما أأكل أُفْرِح أمي، وبيني وبينكم: طبخ أمي شهيّ ولا يقاوم. وهناك، الخضار والفاكهة طازجة وطبيعية. من اليوم الثاني أبدأ بفك زر البنطلون بعد وجبة الغداء ثم السحاب، ثم أطلب من أختي شيء واسع ألبسه: بدك عباية؟ أكيد! وهكذا أقضي إجازتي في العباية، في مطبخ صغير حول طاولة الطعام، مع أخواتي وأولادهم، بين ضجة الضحك والكلام وصراخ الأطفال ورائحة الطبخ، وعلى قلب ماما مثل العسل. كنت في السابق أصرّ على أمي أن تطبخ صنف واحد وأن لا تمضي وقتها في المطبخ حتى نستمتع بالإجازة، كانت بعد إلحاحي توافق بامتعاض، ولكني كنت أحس بحيرتها وعدم ارتياحها. فإنّ طريقتها كمعظم أمهاتنا هي في التعبير عن محبتهن من خلال تقديم الطعام، بإصراري عليها بتحديد ما تطبخ خلال إجازتي، كنت أحرمها من تقديم محبتها وعطائها من دون أن أدري. علاقتي مع ابني الوحيد تختلف. ربما لأنه وحيد، وربما لأنني عشت معظم حياتي خارج سوريا، وربما لأنني تأثرت بعض الشيء بأصدقائي غير العرب. فإنّ طريقتي في التعبير عن محبتي له، كانت ولا تزال تحصل من خلال طرائق أخرى غير الطعام. عندما كان طفلاً كنت ألعب معه كطفلة. وعندما كان مراهقاً كنت أشاركه هواياته إن كان في مشاهدة فيلم أو سماع موسيقى صاخبة، أو أي شيء آخر. كنت هكذا، أُسْقِط مرة بعض مرة جدار الأمومة والمحاضرات حتى يشعر بي كصديقة وينفتح لي ويخبرني بما يدور في رأسه. ربما طريقتي كانت أيضا تلاعبا بابني كيف يفتح قلبه لي كما تفعل أمي كي نفتح أفواهنا للطعام. لم أفكر بذلك من قبل، ولكن النتيجة أن علاقتنا، إن كانت علاقتنا كأم بابنها أو علاقة الصداقة، ما تزال قوية إلى الآن وقد شارف على الثلاثين من العمر. قد أُحضّر بعض الأكلات عندما يزورني ولكن في معظم الأحيان نذهب إلى مطاعم وكافيات أو إلى السينما أو نقوم بأنشطة نتشارك الاهتمام بها. كانت حماتي تلومني أنني لا أتصرّف كأي أم محبة، بالنسبة إليها كان علي أن أحضر عدة وجبات وأضعها في الثلاجة قبل أن يأتي ابني من جامعته في أوروبا، هكذا يتسنى لي الوقت كي أطبخ أصنافا أخرى. وكأنه لا يكفي عدة ساعات في المطبخ يوميا، بل يجب أن أقضي أسبوعا قبل وصول ابني في تحضير الوجبات وتفريزها. كنت أجيبها: أحبّ ابني بطريقة مختلفة. هذا لا يعني أننّي أحبّ ابني أكثر مما تحبني أمي، أو أنّ ابني يُحبني أكثر من محبتي لأمي. لا، لكن الطريقة مختلفة. ربما طريقتي تتناسب أكثر مع الحياة في أوروبا. فالحياة في أوروبا كما هنا في ألمانيا تختلف كثيرا عن سوريا والدول العربية. يكفي أن أولادنا يكبرون مع لغتين، العربية في البيت والألمانية في الخارج، وبرأيي إن تكتفي الأم بعلاقتها مع أولادها فقط في البيت من خلال رعايتهم والاهتمام بهم والطبخ لهم، عاجلا ما ستحصل هوة بينها وبينهم، فهم سيعيشون حياتين منفصلتين. وقد توجد هذه الهوة بينهم حتى في حياتهم داخل البيت إن لم تكن الأم قادرة على سبيل المثال مشاركة أطفالها في مشاهدة فيلم، على الأقل، بسبب اللغة. ربما قد حان الوقت لاعتماد علاقة جديدة مع أولادنا، علاقة تختلف عن علاقة أهلنا معنا، علاقة تتناسب مع المكان الجديد وتُقلّل الفجوة بيننا وبين أولادنا التي بطبيعة الحال ستظهر وتكبر مع بلوغهم في العمر، حتى لا يأتي اليوم الذي نبدو كما لوكنا من كوكب آخر بالنسبة إلى أولادنا. وإن وجّهت كلامي للأم فقط، فذلك من تجربتي كإبنة وأم ولكن برأيي على كل من الأم والأب أن يعملا على ألا يسمحا لهذه الفجوة أن تزيد، أن يكون كلّ واحد منهما صديقاً حقيقياً عندما يستطيع أن يشارك أولاده في أنشطة ولو مرة في الأسبوع. ألا نقول: إن كبر ابنك خاويه؟ برأيي الصداقة أفضل من الأخوة في هذه الحالة، جدار الأخوة ولو كان أخف من جدار الأمومة أو الأبوة ولكنه موجود. وعندما قلت أن نسقط جدار الأمومة أو الأبوة مرة بعض مرة، فذلك لأننا لا يمكننا إسقاط دورنا كأهل بشكل دائم. ولكن عندما تقومون بدور الصديق، كونوا أصدقاء بكل معنى الكلمة من دون إعطاء محاضرات ونصائح وتوجيهات، فقط عيشوا اللحظة واستمتعوا بها، فهكذا توثّقون الرابط وتوسّعونه مع أولادكم. نعم، “أحن إلى خبز أمي وقهوة أمي” وطعام أمي وعلاقتي بأمي وأبي، فهي علاقة مقدسة. وأرغب أن يكون جزءا من علاقتي بابني شبيها بتلك العلاقة، أن يحنّ للوقت الذي يمضيه معي. ولكني أتقبّل أن جيل اليوم غير جيلنا، ونحن في أوروبا وليس في سوريا، والمجتمع غير مجتمعنا، والمفاهيم مختلفة. كل ما يتطلب الأمر هو أن نفتح ذواتنا للتغيير، وأن يشملنا هذا التغيير لكي يكون لنا وجود في حياة أطفالنا يتجاوز الطعام أو الشعور بالواجب لزيارة الأهل. لذا أقول دائما: أنني حدّثت نفسي كتحديث أي تطبيق كي أتناسَبُ مع هذا الفضاء الجديد ولا أجد نفسي خارج فضاء ابني كليّاً. وهذا لا يعني أنني دائما موجودة في حياته، فهو في بلد وأنا في آخر، أحترم خصوصيّته، وحياتَه المُستقلّة. ولكن عندما نلتقي يكون لقائنا لقاء صديقين مخلصين، نستمتع بكل لحظة من كل يوم نقضيه مع بعض. هناك دائما شيئا نتحدث عنه، وشيئا نقوم به سويا، وشيئا نضحك عليه وبعض الوجبات التي أحضرها له أو بالعكس هو الذي يقوم بتحضيرها. في النهاية الطعام يجمعنا دائماً إن كان في البيت أو في المطعم، والصداقة تقوّي علاقتنا بأولادنا وتجمعنا معهم في كل مراحل عمرهم وفي كل مكان، إن كانوا قريبين أو بعيدين. اعملوا إذاً على أن تحتلّ الصداقة جزءاً كبيرا من علاقتكم بأولادكم منذ صغرهم، فالصداقة ستقرّبكم منهم أكثر مما تتخيّلون. ستعزّزون رابطاً قويا معهم على الرغم من المسافة فيما بينكم، أو اللغة والثقافة والأرض الجديدة. ويوماً ما لن يدفعهم الواجب، أو الشعور بالذنب أو الشفقة لزيارتكم وتمضية وقتاً معكم، بل سيقومون بذلك لأنهم يستمتعون برفقتكم وبالوقت الذي يقضونه معكم. أحبّوا أولادكم بأن تكونوا أصدقاءً حقيقيين لهم. ديانا العطواني مترجمة سورية من اللغتين الفرنسية والإنكليزية إلى العربية. تعمل ديانا في ترجمة الكتب منذ أكثر من 12 عاما. وهي أيضا معلمة يوغا.تنقلت ديانا خلال الثلاثين عاما الماضية بين عدة بلدان (نيجيريا، سويسرا، تركيا والآن تعيش في برلين). وقد أغنى هذا التنوع الجغرافي مهاراتها اللغوية وخلفيتها الثقافية ومنحها وجهة نظر مختلفة عن الحياة في سوريا وفي الخارج. وقد ساعدها هذا الاندماج مع عدة ثقافات على احتضان مجتمعها السوري والمجتمعات المستضيفة بعقل محلل وقلب مفعم بالمحبة. Hania Hakiel and Antonia Stasiuk draw comparisons between the experiences of survivor's guilt in Holocaust survivors with those of Syrian refugees in Berlin, to show how such guilt is a fundamentally human experience.